P. Punpongsanon, D. Iwai, and K. Sato. IEEE TVCG ’18 (in press). Visually Manipulating Perceived Fabric Bending Stiffness in Spatial Augmented Reality. The bending stiffness of a fabric is an important indicator for determining its comfortability, thus influencing a person's purchase decisions. In the textile industry, the bending stiffness of garments is intensively considered to provide customers with appropriate impressions. When designing a garment product, investigating the optimum bending stiffness requires many physical samples with different bending stiffness values. Hence, preparation for this evaluation is often difficult for a designer. A customer also faces difficulty when searching for a garment product with the required stiffness because the available number of products in a retail shop is only limited. 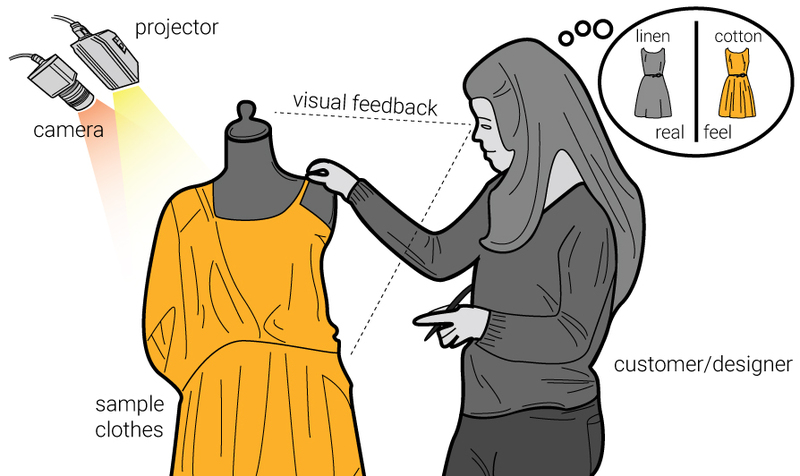 Researchers have attempted to address this issue, particularly for the garment industry, by applying augmented reality (AR) technologies that allow customers to explore different clothing appearances without requiring the actual fabric. This technology is called 'virtual fitting room'. Systems that can capture a customer image and display him/her on a computer monitor with different clothes are synthesized by either computer simulation or image-based rendering techniques. However, synthesizing fabrics with physically accurate flexible behaviors generally requires expensive computational costs. Thus, realizing an AR system that can manipulate the stiffness parameter of displayed fabrics in real time is technically challenging. Moreover, displaying the images on a computer monitor also degrades the reality of fabrics owing to the limited dynamic range, field of view, spatial resolution, and parallax representation of computer monitors. This study adopted a different approach from the above-mentioned video see-through systems. We propose a novel spatial augmented reality (SAR), or projection mapping, technique, in which users can directly observe the augmented fabrics with their eyes, thus minimizing the reality degradation of the fabrics. The main challenge of this study is evaluating whether the proposed method that modifies the fabric's apparent motion with projected imagery is suitable for manipulating the perceived bending stiffness of a fabric. Considering the optical flow of a fabric motion, which is significantly important to estimate the fabric stiffness for the human visual system, we generated projection images by magnifying or reducing the optical flow. We refer this process as flow enhancement method. We conducted a psychophysical study to investigate the relationship between the magnification factor and perceived stiffness to derive a computational model that can predict the perceived bending stiffness of the fabric under projection in our flow enhancement method. %To do so, we take into account the motion features of a fabric, which are significantly important to estimate the fabric stiffness for the human visual system. %We conducted a psychophysical study for investigating the relationship between motion parameters of the features and perceived stiffness to derive a computational model that can predict the perceived bending stiffness of fabric under projection of the visual effect. In addition, we established a prototype application system called FleXeen to validate our computational model by using practical fabric behaviors. The proposed concept is illustrated in Figure 1. Figure 1: Proposed concept: A fashion designer (or customer) can easily explore afabric with desired stiffness. The figure illustrates that the proposed system provides the user with the perceived stiffness of a cotton on the linen dress. In summary, this study provides the following contributions. We introduced a novel SAR approach that manipulates the perceived bending stiffness of a fabric in real-time by using an optical flow enhancement technique. Through a psychophysical study, we investigated the relationship between the magnification factor of our flow enhancement method and the perceived stiffness of a fabric. On the basis of the study result, we established a computational model to predict the perceived stiffness under the flow enhancement projection. Subsequently, we developed a prototype system that allows a user to accurately control the perceived bending stiffness and confirmed its feasibility via a user study. © Since 2011, Parinya Punpongsanon.